Although our friends in the United States still have Thanksgiving to celebrate at the end of the month, in Canada, it's now full-steam ahead toward the December holiday season..and for many of us, that means it's time for Christmas. Soon enough (maybe even this weekend), the decorations will start appearing, the stores will start playing 24-hours of Christmas music, and maybe you'll start getting a bit stressed out. As much as the holidays bring families together, they can also be an overwhelming time. These are a holiday classic, but you might wonder how they came to become associated with Christmas. Actually, the plants are native to Mexico. They were introduced to America (and thereby Canada) by Dr. Joel Roberts Poinsettia -- the name is making sense now, isn't it? As for their association with Christmas, there are a couple of theories: one, that it's symbolic of the Star of Bethleham, and another, based on a Mexican legend. 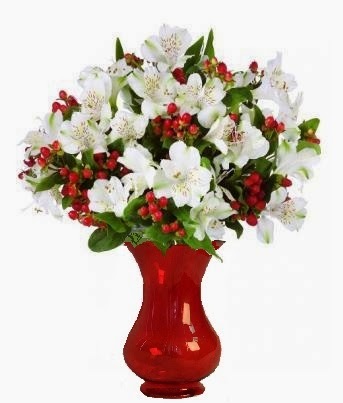 However it came to be, its beautiful red blooms match up with the colours of the season perfectly. If you'd like to bring some Poinsettia magic into your home this season, we recommend this Supreme Poinsettia basket for maximum effect. Is there anything the rose doesn't work for? In terms of floral arrangements, we've yet to find it. Pairing red and white roses together, like in this bouquet, can make for a gorgeous, festive look for the holidays. Adding in some Carnations or Chrysanthemums, as offered in our "Holiday Tradition" bouquet makes for a bit of a different, but equally gorgeous arrangement. Carnations are not necessarily a typical choice for the holidays, but this flower is popular year-round. And with the deep-red version of the plant, it proves to be quite festive. Our Crimson Delight works really well for your living room, kitchen or on the mantle of your fireplace to bring some natural colour to the hanging of the stockings. This is one of the more new-age, trendy holiday flowers that we've seen growing in popularity over recent years. Haven't heard of this flower? Maybe you know it by its more common name, the Peruvian Lily. Whatever the case, the 100 Blooms of Alstroemeria bouquet pictured on the left is absolutely gorgeous, and certainly unique in any space. 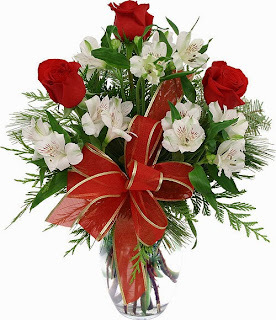 We'd love for you to check out our full array of Christmas flowers if you're looking for some decoration this holiday seaosn. And whether you're celebrating Christmas, Hanukkah, Kwanzaa, or heck -- even Festivus... we wish you a very happy holiday season indeed. Although our friends in the United States still have Thanksgiving to celebrate at the end of the month, in Canada, it's now full-steam ahead toward the December holiday season... and for many of us, that means it's time for Christmas.